1 x Princess Wand. 1 x pair of Princess Gloves. 1 x Princess Crown. 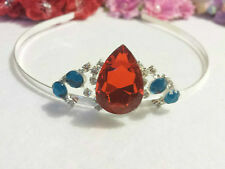 1x Princess Bracelet. 1 x pair of Princess Earrings. 1 x Princess Ring. 1 x Princess Necklace. The images are for reference only. Handmade, beautiful tote mini bag. Little girls size 5/6 Pink Princess style dress. This main dress is made from a pink polyester satin, the bodice insert is made from a pink sequin material. Shoulder to hem length 36". This listing is for a red and white tulle and satin ribbon party dress. It fits girls ages 3-7 with adjustable straps. Used only for photo shoots in great condition. Please feel free to contact us with any questions you may have. Best offer is available. 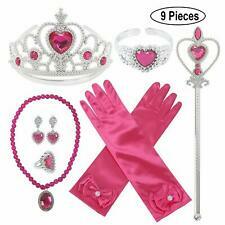 Accessory set includes: a Pair(2) of Gloves, Tiara/Crown, Wand/Scepter,necklace and earring. We are committed to resolve all issues in a friendly and satisfactory manner. Beautiful Elsa like dress from Disney movie Frozen, beautiful snow flake Brooch, sequin beading through out bodice, very cute! Made to resemble Elsa's dress in the Movie Frozen! Every Elsa fan will love this dress! It would fit most young girls between the ages of about 2-6 as it has an elastic waist and is made of stretchy fabric. And then wear the beautiful hair band style tiara crown with blue and white jewels from Claire's with a cute outfit to school or Church. Great for Halloween, Dress Up, Theater! The photos are of the actual item that is being sold. Chest 20,5". DELUXE CINDERELLA COSTUME SET OF ACCESSORIES. Satin Headband (one size, fits adults and girls). Girls Princess Short Sleeve Dress. Colors: Blue Lace on White Cotton. Lace: 100% Polyester. Elastic in dress and in head piece is in excellent condition. Dress is in excellent condition; bodice is lined; 20" back zipper; dress has verticle darts in bodice front and back. Little girls size 4/5 Pink and White Dress with matching dress for AG doll. The bodice is made from a pink poly satin with a pink lace overlay on the front and sleeves. The skirt has the matching pink poly satin with a white satin in the very front. POCAHONTAS COSTUME SET OF ACCESSORIES. Scepter 1. 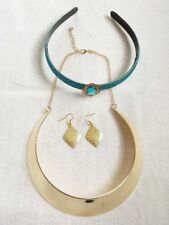 Necklace 1. The images are for reference only. we believe the good communication will resolve everything. Girls Silver Fairy Princess size 8 outfit includes star-spangled grey dress with cross-over bodice on the empire waist, silver ribbons and flyaway front. A star purse is included and is filled with tiny treasures (necklace, play money, etc). PRINCESS ANNA, FROZEN COSTUME SET. NECKLACE, SUNFLOWER HAIR CLIP, CROWN. Princess Belle Top Shirt Yellow 3T Handmade. Condition is Pre-owned. Shipped with USPS First Class Package. So pretty in classic snow white colors. Lot of lace and sparkling starlight sequins make this little dress magical!